The Beauty Scoop: Hot Product: Avene XeraCalm A.D for itchy skin! One of my favorite lines for sensitive skin is Avene. Though my skin doesn't tend to be as sensitive as it was when I was younger, I still get super itchy after I shower or when my clothes are accidentally washed in a different detergent. Being allergic to mosquitoes (and in Texas, too!) sure doesn't help my itchy skin problems. 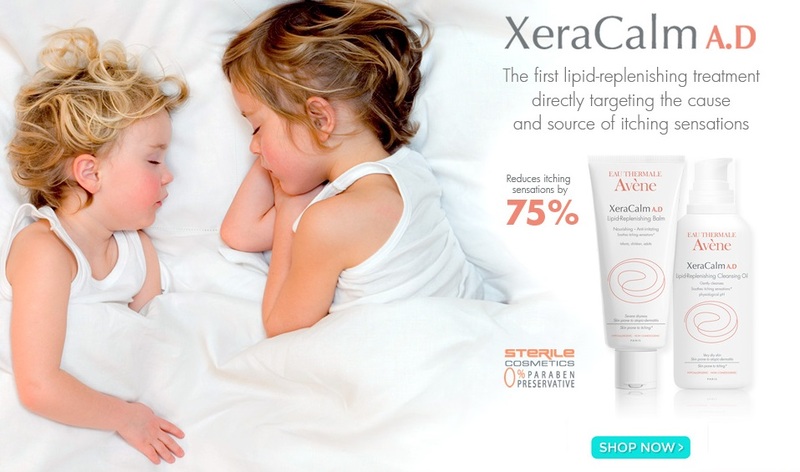 When we received Avene's new line, XeraCalm A.D, I just HAD to try it. With a cleansing oil, balm and cream, it tackles my occasional itchiness but will also relieve dermatitis and eczema. Where, oh where were these products when I was five years old and suffering from eczema? Best of all, these products can be used on the face and body, by infants, children and adults. Worried about ingredients? The XeraCalm line is paraben-free, fragrance-free, alcohol-free, hypoallergenic and non-comedogenic. The Cleansing Oil is also soap-free and gentle enough to use on rashes or flare-ups. The Balm and Cream are both preservative-free, provide 48 hour relief, and feature Avene's unique packaging that keeps the product sterile and free of contamination from your first use, to the last. Avene also put 12 years of biotechnological research into these formulas, so you can expect the best. Having suffered from sensitive skin all my life, I know that it's not only frustrating at times, but can also be expensive. That's another reason I always recommend Avene to our clients. You get a great amount of product for a reasonable price. Fix Your Dry, Cracked Hands! Hydrate and SAVE With beautystoredepot!